Every year, about 280,000 ha of forest area burn in the Iberian Peninsula. Both countries national forest inventories were harmonised to provide consistent results of the influence of forest stand structure on fire probability. 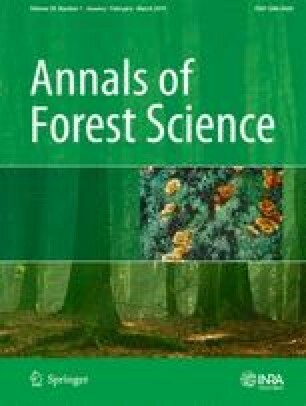 Results show that basal area and vertical structure variables are associated with fire probability; however, that association varies with forest composition. Deciduous oaks and pine forests showed opposite tendencies. Forest management could be oriented considering these results. Fuel variables, in particular the ones that characterise stand vertical structure, are extremely important to determine the occurrence and severity of fire. However, documentation on fire occurrences and stand characteristics is still scarce in southern Europe. In this study, we analyse the stand and structure variables from National Forest Inventories (NFIs) in order to identify the important ones that are associated with the presence/absence of wildfires in the Iberian Peninsula. A harmonised database including a characterization of the vertical structure of the stand and its species composition was obtained by combining data from NFIs from Spain and Portugal and data from burned areas that occurred between 2005 and 2015. Stand characteristics results show that the plots that were later burned have lower average stand basal area. For deciduous oaks, more canopy cover has less probability to burn, and for all the other oaks, in different degrees, more understory cover has higher probability to burn. Regarding pine species, more canopy cover has lower probability to burn. The results indicate important associations between stand variables and the presence/absence of wildfires that could support the forest management with the objective of reducing the probability of forest fires. The authors wish to thank Roberto Vallejo and Vicente Sandoval of the Spanish Ministry of Agriculture, Food and Environment for kindly providing access to the full Spanish NFI datasets and to Paula Sarmento and Conceição Ferreira of the Portuguese National Forest Services for kindly providing access to the Portuguese NFI datasets. We also want to express our thanks to the TRAGSA field teams of the Spanish National Forest Inventory. Leónia NUNES: experimental design, data analysis and elaboration of the paper. Juan ÁLVAREZ-GONZÁLEZ: experimental design and writing the paper. Iciar ALBERDI: experimental design and writing the paper. Vasco SILVA: experimental design and writing the paper. Marta ROCHA: experimental design and writing the paper. Francisco CASTRO REGO: experimental design, data analysis and writing the paper.